Our culture is simply rife with aphorisms pertaining to our belief in work ethic as well as an adherence to truth and solid values. Of course, the risk here is that our reliance on truth and common sense has morphed into the realm of platitude with the most recent generations. Our leaders aren’t helping the cause either by constantly damming the stream of knowledge and stemming the flow of wisdom to the next generation of leaders. We could, of course, surrender right there and simply give over our progeny and our nation to the multi-generational refuse that have situated their posteriors in our capitals and congresses or we can begin to apply that truth and wisdom we love. “Anything worth having is worth working for” hasn’t lost any of its value or potency despite all attempts to convince our countrymen that you can have it all without effort and without hardship. I might adjust it slightly to insist that “Anything worth having is worth fighting for” because at this point we are past the point of working it out. Friends and neighbors, I’m here to tell you that we are in a fight for our lives, our freedom, and the soul of our nation. If we’re not ready to fight we are in trouble because our opponent is not only prepared to fight they’ve been fighting us with guerilla tactics, purpose, and tenacity for years. There is no respite remaining for us and any delusion that we can get along and coexist in a political sense with our opponent must be abandoned. We must also come to recognize that our enemy is both without and within. The advocates of American cultural destruction, big government control, cradle to grave welfare and economic cronyism are not only in the political parties but prolific in our businesses and our communities. George Washington’s admonition to avoid the allure of party entanglement in favor of diligent observation and remaining well informed seems more prescient than ever now. We must demand of our state legislators the push to an Article V convention as our best course of action to counter the entrenched bureaucrats and lifetime politicians arrayed against us. The political machine in Washington particularly and within the political parties in general is a powerful and merciless animal that must be gutted with the weapons forged for us by our founders. Man will always tend to power and control over his fellow man and our founders knew this. Article five of our constitution provides for a solution. Very intelligent and well informed scholars on this subject have detailed what can be done so I will not attempt to go into specifics that I am ill prepared to support but I do believe that we should seek redress on some very important issues. I submit the following items for your consideration in this matter. Our federal government should be required to operate under a balanced budget that clearly dictates what congress, the executive and the bureaucrats can and cannot do as well as what they must do regarding same. Congressional representatives should serve limited terms in office in the same manner as our president. I believe there is no need for a member of congress to server more than 12 years therein. A supreme court justice should be required, as with our president and members of congress, to be a citizen of the United States. A supreme court justice should not serve a life term but should be limited to a term of 10 years or some other predetermined timeframe. The power of the court today versus as originally intended and the life expectancy of people today versus at the founding puts us in a unique situation that I believe requires this additional limitation on our supreme court justices. 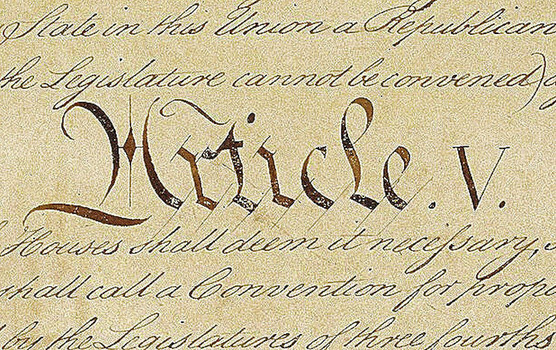 The 17th amendment to the U.S. Constitution should be repealed forthwith and return to the original intent of the founders that senators be beholden to the states they represent and not to a broader national agenda. A repeal of this amendment would mean that the senators would not be elected by popular vote but would be appointed by the state legislature of each state. These same senators would face recall by their state legislators if they failed to adhere to the policies and wishes of their state. This would return our federal representation to its original balance with state representation in the senate and popular representation of the people in the house. I won’t go beyond that at present because I think it is essential that the Article V convention be limited in its scope from the outset. This cannot be a runaway process that is either open to all changes whatsoever or is doomed to fail for lack of agreement on important issues. I want to emphasize further that unlike our opponent who wish to constantly change the rules on the fly and with each new whimsical idea this is a call to follow the mechanisms of our constitution as handed down to us from our founders. This is not some mystical, arcane trick to fool our people but the actual process enshrined in our founding documents for making the changes that our opponents tells us all the time must be made with judicial fiat or the concept of the “living, breathing document” they claim our constitution to be. This is the proper and secure method for reigning in an out of control government. This is the correct path for opposing greedy, power hungry politicians. This is the American way to do things and the Constitutional solution to problems. We must be ready for the fight my friends. We must be prepared for the counter punch and the flailing of the wounded beast that is government. Our opponents will strive to choke off our voice and they will do everything in their power to destroy or otherwise silence any politician who dares aid us or even agree with us. We must be immune to the hatred, anger and putrescence that they will spew as we attack their hold on our lives. We must be prepared to face even the dissemination of our own failures and weaknesses for all to see. Get right with the truth before this battle. Clear your closet to your friends and family and keep our enemy from using it against us. There is no limit to the depravity or perversion they will employ in their attempts to hold onto power. Our children and grandchildren and the descendants of our progeny for all the coming generations are worth the fight we must undertake and the pain we must endure. We are heirs to a great heritage of diligence, vigilance, sacrifice and determination. We cannot surrender our heritage here. We cannot be the generation about which our descendants write “they surrendered for generations the freedom of our forefathers”. Let us work together my friends. Let us root out the parties, reign in the politicians and force competition and freedom on the cronies no matter what hole they may have taken refuge in. The fight must be accompanied at all levels from the bottom in our towns to the executive, legislative and judicial branches, and the deep state itself. We must fight now lest our children and grandchildren be the first American generations to return to tyranny.